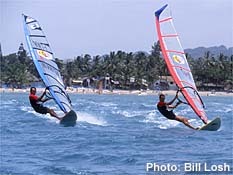 Go to CabareteWindsurfing.com for all windsurf info in Cabarete that you might need. Windsurfers have been visiting Cabarete since the mid 80s because of the fantastic conditions available for every level of sailor. Cabarete has played host to numerous world-class events. Every June, it hosts Cabarete Race Week, an international windsurfing competition that incorporates exciting windsurfing competition and a ton of fun! All windsurfing centers are located right in the Bay for easy rigging and direct launch from the beach at their site. You can rent gear, store gear, purchase gear and take every level of instruction	from each windsurfing center. Visit their web-site Established in 1989, recently changed name from "Happy Surfpool", our center was one of the first windsurfing schools in Cabarete. Years of experience have taught us how to attend best the needs and wishes of our clients, who come from all over the world. Visit their web-site Wether you are into windsurfing, kiteboarding or SUP, CNS has it all. Whether you're just beginning the sport, or are at an expert level, you'll find the conditions that make it perfect for you. The Eastern Trade Winds provide strong and consistent wind all year round. The water is warm all year round as well; averaging about 26 degrees Celsius, so there's no need to bring your wetsuit. The 2 km wide bay has a sandy bottom, with only a few spots of reef in the inner bay that are quite easy to avoid. Sailing conditions in the mornings are perfect for beginners or children, as the water tends to be flat and the winds light. Early afternoon sees the winds increasing for intermediate to expert level sailing. The wind can continue to increase until mid-afternoon and then maintains consistency until around 6:00 pm, for a great afternoon of sailing. At certain times of the year the reef enclosing the Bay creates great wave sailing conditions. At other times, flatter waters are optimal for slalom sailing. Beginner level in the morning. Intermediate to Expert sailing in the afternoon. Great conditions to learn and practice wave sailing. World-class wave sailing on the reef. Flatter waters great for slalom sailing. Waves are not as consistent as in other periods. The months of May, and the period from October to the end of December, tend to be less reliable in terms of windsurfing conditions. They can vary from not that great, to excellent, depending on the weather systems moving through the area. Cabarete still sees many windsurfing visitors during these periods because there are so many other activities available should the wind not cooperate for a day or two. Wind & Wave Report by "No Work Team" in Cabarete. Updated twice a week. Wind Statistics. Data compiled by "No Work Team" in Cabarete. Discovery of Cabarete: Read Jean Laporte's story how he discovered Cabarete as a perfect windsurfing destination. Aerial photograph of the Cabarete Bay. This pictures shows the crescent-shaped bay and with all its reefs.